The above image is one of the projects I did with over a 150 grade 5-6 children in public schools in Calgary, AB. Where I asked their teachers to participate in a healing the fear project that was part of the work a psychotherapist was doing in Colombia. 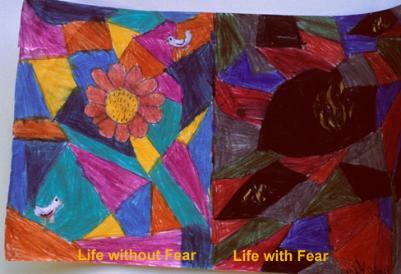 The student above made one image of her life "without fear" and one "with fear"-- these results are striking of the way young people depict the impacts of fear aesthetically and artistically (see more at Art Research). 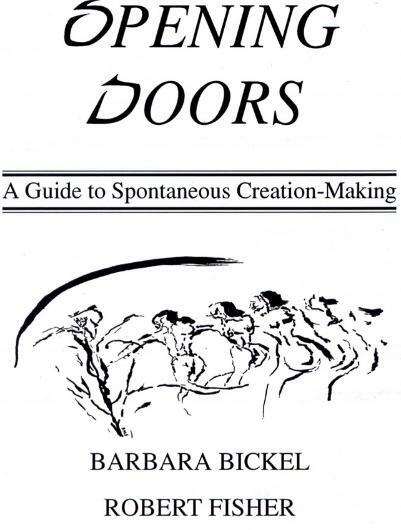 The book cover "Opening Doors" shows the model that I decided on eventually as "spontaneous creation-making" and my partner Barbara and I did a lot of workshops and created this manual. Both Barbara and I would be glad to facilitate this process with you and/or your group or organization with intentions of self-exploration and group-exploration, where the "deeper" sides of life can be brought to the surface and healed in a gentle and beautiful way through transformative experiences brought on by spontaneous art processes. You don't have to be an artist to enjoy and benefit from this work and play. For further info. on my therapeutic counseling practice see Coaching. I began my journey in my adolescents creating art that was representational. Soon I learned it is a great way to express and to heal. I was fortunate to be hired as a therapeutic consultant in the 1980s-1993 and began using art for therapy work with youth and families. I gave in-service workshops in the use of art to many organizations in human services, and began developing my own model. I was not so interested in the purely clinical approach but rather a creative-arts-based approach to art therapy. I studied and experienced workshop intensives with some great art and expressive therapists, Bonnie Bultz, Robert Rice, and Martin Fischer, and began hanging out with art expressive therapists in the Alberta Art Therapy Association in the 1980s. I read voraciously and put ideas in practice, of which Shaun McNiff's theory of expressive arts therapy suited my style as did Edith Kramer's art therapeutic education approach.